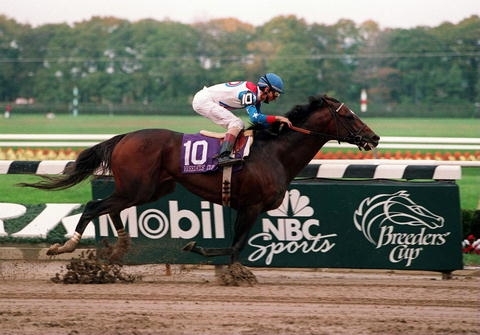 Home > Mare's Musings > Memories of Cigar: Sensitivity and Grit, Guts and Glory. It’s October 8th, 2014, and by this time everyone in the world of international horse racing knows that Cigar, one of the world’s greatest Thoroughbreds ever, has died. Race fans all know Cigar’s background and statistics; I have nothing to contribute to the enormous body of knowledge about the magical horse’s achievements. I found out early this morning that the magnificent Champion had died, and I’ve been crying ever since. Somehow I–like many of you–just assumed that Cigar would live forever. It never crossed my mind that he could be felled by anything as mundane as illness and old age. But mortal he was, and today our sport is in group mourning. The Earth is a sadder place, for Cigar no longer stands on it. I wish I could recall the exact date, but it Cigar Day at Saratoga Race Course, and cigars were handed out to everyone in attendance. The cigars featured paper bands that commemorated him. Just before he was to be paraded down the track, I high-tailed it to the paddock path rail. I knew that I couldn’t get close enough to the track–or see over the heads of tall people–to actually see Cigar as he paraded in front of his admirers. So I was content to stand at the paddock path rail, and wait for him to return. From our place at that rail, we could hear the insane, joyous screaming of thousands of Cigar fans. As the horse got closer to the paddock path, the screaming got louder. We who’d stood patiently would get to see the Champion even-closer than those who’d crowded the finish line and main track rail. That would have been good enough for me–just to be THAT close–maybe even to breathe some of the same air as one who carried Greatness in his soul. Cigar must have been really jazzed after the crazy-loud screams, and all the love that must have pushed its way onto the track, showering him with profound appreciation. He danced onto the paddock path, tossing his head and puffing his chest. Some may have misinterpreted this as agitation, but the look in his brilliant, knowing eye told the story: he was worshiped–he was The King–and he knew it. I stood with my hands on that rail, just staring at him. While everyone around me cheered wildly, whistling and clapping–I stood stock-still, my heart and soul so filled with love that I think I stopped breathing. I stood in awe, for rarely do humans get to be that close to genuine Greatness, and this was my moment. I wanted nothing more than to drink in his magic, to perhaps catch just a whiff, an ounce, of his spirit. Dancing and tossing his head, suddenly Cigar stopped. He looked at me with his right eye–lowered his head toward me–and just stood there, taking me in. Even with all the cheering going on around us, I could hear him breathing. We two were caught in this cosmic, spiritual and quiet place for–oh, I don’t know–somewhere between 30 seconds and 10 years–and then he walked forward again, exuding testosterone and confidence, and giving his fans what they wanted. “He knows that I love him,” was all I could say. “We ALL love him!” he smiled as he exclaimed. Yes, it was something, an experience I’ll never forget. I felt blessed that day–I’ve thought about the experience often–and today, in my profound grief, I am comforted by the memory of that single moment in time. One of the docents at the Hall explained to us that, when Cigar first moved into the Hall, his stall–and paddock–were right next to those of John Henry. Well, the two truly great race horses–no doubt, with egos to match!–spent hours every day, racing each other around their respective paddocks. So Cigar was moved across the way, where the two men could see each other but not race each other. And that is the heart of a Champion–a real, living, breathing legendary race horse like Cigar and John Henry. That, even in “retirement,” living in a beautiful, big stall and having no responsibilities–they are compelled to kick the derriere of someone. It didn’t matter to either of them, that there was no winner’s circle photo or trophy at the end of that race: beating the tar out of the other guy was the reward. And that, I believe, is one of the things that separate we mere humans from race horses, my friends: humans get into horse racing with dreams and hopes of winning. The trophies and photos are important to humans. And that’s OK, for humans just aren’t as pure as horses. Horses run and become obsessed with winning simply because that’s what they do. Their single-minded goal of kicking the other guy’s behind is all they need for motivation. So here are two stories about Cigar, one of the most noble, perfect, single-minded Thoroughbreds since the breed was created. One story, I hope, will confirm for you that, not only was he big, brash, strong and powerful–but he was also so sensitive that he could pick up the vibe of pure love in the midst of a loud, cacophonous crowd. The other people did love him, I have no doubt–but the sensitivity of his soul found the quiet place in my own spirit and he made the effort to connect. 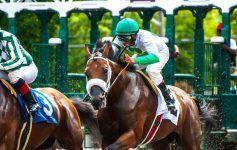 The second tale makes us smile, because it proves that great race horses never stop racing, even if it’s paddock-racing against another member of the Pantheon. The fact that the two horses absolutely, positively would not stop racing each other–so they had to be given a permanent “time out” –is one of the best stories of equine spirit that I’ve ever heard. Spiritual sensitivity and determination never to give up: what a great legacy Cigar has left the world. The victories, money and YouTube videos can’t tell the whole story of such a tremendous soul. Cigar has died, and he took a big chunk of our hearts with him. If ever there was a horse worthy of being God’s own mount, it was the “…unconquerable, invincible, unbeatable CIGAR.” I’m sure that tonight, even God has to take a ticket and wait, for Cigar is in the heavenly paddock, once again racing John Henry and threatening to kick him where it hurts. My grief is tempered tonight only by my recollection of those two experiences, which I’ll cherish forever and a day. Thank you for the memories…I love you, Cigar. I REALLY LOVE YOU. Many thanks to the Breeders’ Cup folks, for the photo of Cigar winning the Breeders’ Cup Classic. Previous Article Mothers’ Love and Horse Racing: Give Us the Reins, We’ll Take ‘er from Here. Next Article Open Letter to Bode Miller: Take Your Time, Pay Some Dues.